Edelbrock MAX-FIRE Distributor - Dezod Motorsports Inc - Home of the automotive performance enthusiast since 2002. 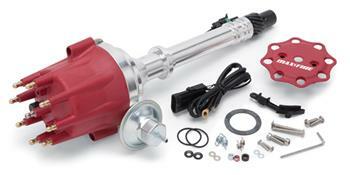 These Max-Fire distributors are ready to run right out-of-the-box and are the perfect upgrade for your ignition system. They’re ideal for replacing or upgrading from a points triggered distributor. They feature precision machining for a perfect fit along with a simple three wire hook up for an easy installation with no need to run an external ignition control box. The centerless ground shaft utilizes an upper sealed roller bearing with an extra long lower bronze Oil-Lite bushing for smooth operation. The high output magnetic pickup and large paddle wheel reluctor deliver a strong trigger signal at high RPM for maximum performance. All of these features allow Max-Fire distributors to provide unrivaled voltage to the coil, ensuring that you’re getting maximum performance from your engine. We recommend a new Max-Fire coil for maximum voltage output, ensuring you get the most from your high performance engine at higher RPM’s. Each distributor includes a cap, rotor, retainer and mechanical advance curve kit.